Make sure everything you write is big enough and clear enough even for the ones at the back. Take a step back to check if you must. Using different colour markers can be helpful. Just make sure you are consistent with the colour coordination, for example blue for vocabulary, green for stress, red for form symbols (v), (n) etc. 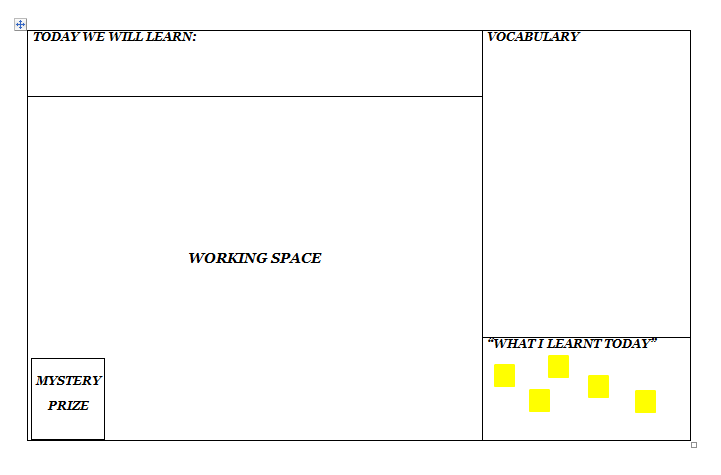 For the "What I Learnt" section, you can use blank post-it notes. In the final few minutes of class students can come to the front, take a post-it back to their table, write something they’ve learnt then stick it on the board as they leave class. (This can form the basis of a quick revision in the next lesson). As a simple behaviour management tool, you can use the Mystery Prize section. Just display a simple piece of paper on the board saying ‘Mystery Prize’. Write something on the back of it or on the board behind it – like ‘No Homework!’ or whatever your prize is. Tell students that if they work hard and behave, they get to reveal the prize at the end of class.